Award-winning burger brand, Cut + Grind have introduced London’s first Keto burger - a zero-carb option, ideal for those embracing the popular Keto diet this new year. 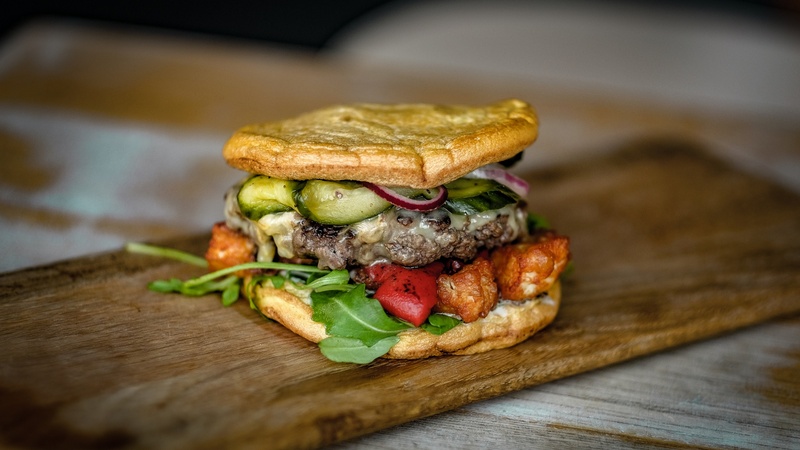 Available now at Cut + Grind in King’s Cross and Boxpark Wembley, the new carb-free burger - a London first - features an aged beef patty, layers of fried halloumi, rocket, roasted red peppers, Cheddar cheese, pickles and rocket; all encased within an innovative souffle egg bun rather than a traditional brioche bun - in keeping with the high protein, zero carbs rules of the Keto diet. The new Keto burger is priced at £11. Cut + Grind, launched in late 2017 within the Urbanest building just behind Granary Square in King’s Cross, takes a unique approach to its award-winning burger patties: most restaurants grind their beef several days prior to cooking or buy in the meat already ground, causing the beef to oxidise and compress resulting in altogether tougher burger. At Cut + Grind, the meat - sourced from traceable British and Irish cows - is ground daily on-site, resulting in a much more fresh, noticeably juicier and delicious burger. Each of the patties are hand-ground and made on site every day, and are available in a range of ‘stacks’ - the Beef Brave, the Classic or the newly launched Keto.